I love a mix a color and texture. I think its the key to achieving that well curated cozy look. Although we are currently living in a rental while we search for our next home, I still want our living room to be inviting and cozy, not temporary feeling. After my daughter's ballet class we went to lunch and to our favorite thrift store. One of the most overlooked aisle thrift stores is the linen aisle. 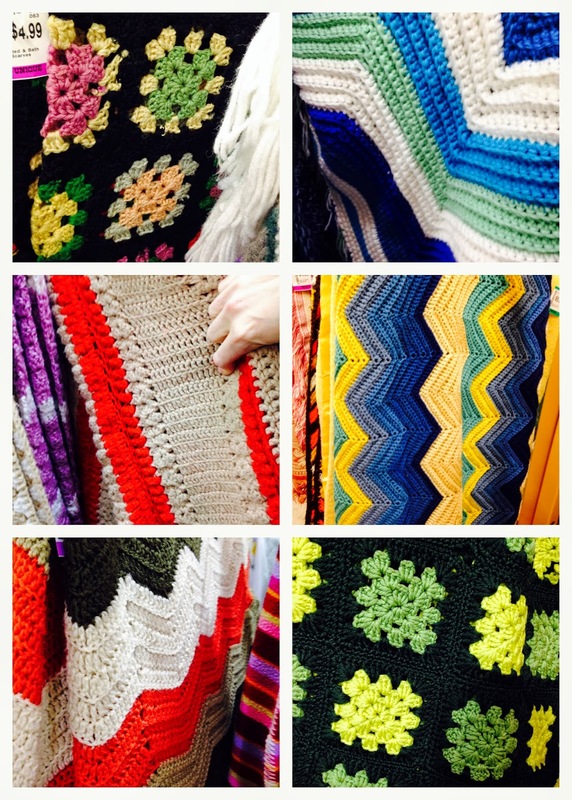 You can find great vintage fabrics, pillow cases, and crocheted afghans. They had quite the assortment to chose from and not a single one was more than $4.99! I picked it for its colors (esp. the yellow and black), the chevron pattern, and its 70s vibe. I also liked that it has a tight weave - I don't want my pillow form showing through. After washing (delicate cycle followed by low temp drying) I set out to make my pillows. I've never re purposed an afghan and I was nervous that it would unravel if I cut it - so I sewed my pillows before cutting them out. First, I pinned a pillow cover I had on to the folded afghan. With the sewing machine, I sewed one seam close to the edge of my "pattern" pillow cover and a second seam about 1/2" around it. I left ~ 6" open along the finished edge of the afghan. I cut out the pillow by cutting between the two seams. This worked and kept the afghan from fraying - this was important as I wanted to make more than one pillow. Once my new pillow cover was cut out, I stitched over my seam a second time to ensure it wouldn't come undone. When I was done sewing, I turned my creation inside out and sewed Velcro along the inside edges of the opening. Adding a zipper would create a cleaner finish but I didn't have a zipper that worked in my stash. If you don't need your pillow cover to be removable, you could also stitch the opening closed with thread or yarn.